We’re getting so close to Halloween and that means we get to try out fun new things with our nails! Sharpie manicures have been pretty popular for quite some time so it’s no surprise that when I found Sharpie came out with a new line of Fine Point Neon markers I was excited to grab a 5 pack from Target and the best part is you can too & use this $1.00 off coupon to grab them while supplies last. Sharpie’s are great for use on paper, plastic, wood, and leather but the fine point tip makes them perfect for nail art! The brilliant, vivid color is great for Halloween making & making this fun Skull Nail Tutorial. 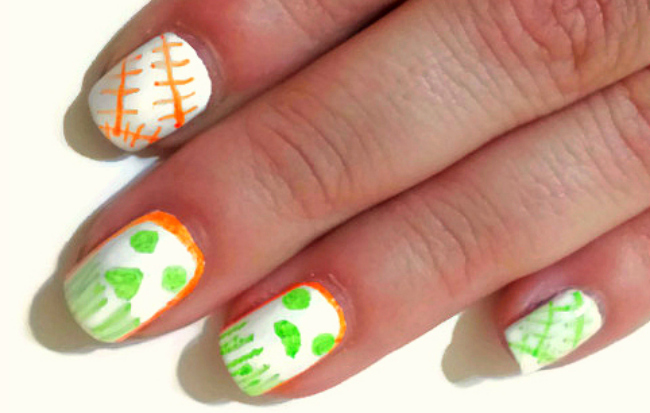 The marker tip leaves bold, detailed lines so using it to draw on your nails is simple. The skull nail sharpie manicure is super simple and easy to do by just following a few steps. When you’re finished up using your fab new neon sharpies to draw on your skull faces, I just went ahead and made some criss-cross lines on the plain nails to add a bit of pizzazz to the manicure. To finish off your Sharpie manicure before applying a top coat you can spray a tiny bit of hairspray onto your nails to prevent the marker from smearing, let it dry for a bit and then go ahead finish this off with a top coat. Don’t forget to check out Sharpie on Facebook and Twitter for some fun inspiration on all things Sharpie! I never thought of doing nail art with sharpies!! That’s a great idea, Ange! Very cute! I bet my girls would love this! So much fun! 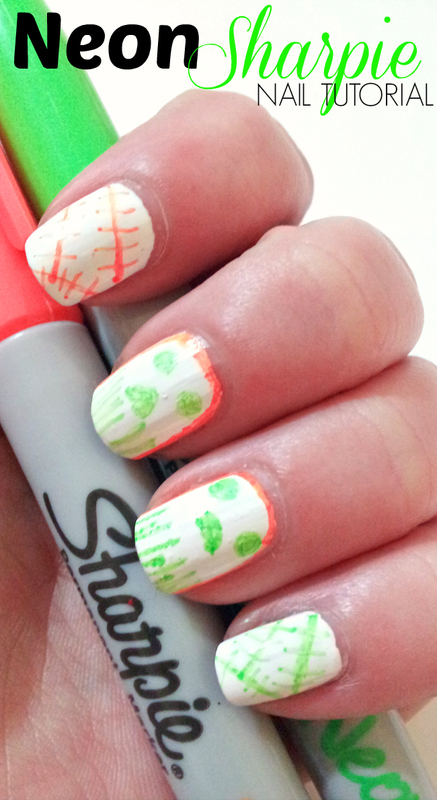 I love “coloring” on my nails with sharpies… easy & awesome! So neat! Love neon sharpies! So fun! Very cute idea! Nice job! what a cool idea! Will be trying it out this weekend. My daughter did something similar a few days ago! How cool. I’ve tried stuff like that with nail polish and can’t get the lines straight. I probably could with sharpie. So cute I need to take better care of my nails one day I will get better but my daughter would love this maybe her and I can do this one weekend together. Cool idea. So question: Did you put one last coat of clear on top? Did the hairspray keep the brush from smearing the design? I’ve never tried a sharpie manicure but now I definitely will! It looks so easy! Cute and so easy to do! Thanks for the tips! Such a great idea, I’m totally doing this for halloween! Those looks great and totally doable! Even I could handle this kind of decorating. Very cute idea!!! You could make ghosts with black too! You are BRILLIANT! This would be so fun to do on Alea’s nails! This looks like the kind of nail decorating I could actually do! ohhhhhhhhhhhhhhhh sharpies are way easier than those stupid nail art pens that dont’ work for us- my little one just asked me to paint her nails with jackolanterns and now i can !! thank you!! My teens are going to love this skull nail mani. Wow, can’t wait to try it out this weekend. These are super fun! I’ll definitely be sharing this idea with my teen daughters! Ohhh, my daughter would love this! Fun! Very cool! My niece would love this! Oh my goodness, I can’t tell you how many classes I sat through as a teen while creating new looks on my nails with a sharpie marker! Back then, people thought this was craziness… haha, glad to see it is no longer crazy. Thanks for making me feel normal… 20 years late. Better late than never, lol. What a cute idea! My niece would love it.